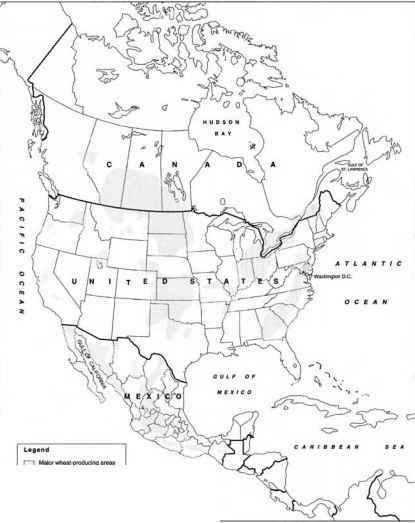 Figure 2.6 Major wheat-producing areas of North America. Line drawing by Tim F. Knight. Outline of map adapted from U.S. Department of the Interior, Geological Survey, North America 1982 (1:10,000,000) (Reston, Va.: Geological Survey, 1982), 1 p. Wheat-growing areas adapted from U.S. Department of Agriculture, Agricultural Research Service, Distribution of the Varieties and Classes of Wheat in the United States in 1979 (Washington, D.C.: U.S. Department of Agriculture, 1982), Statistical Bulletin no. 676, p. 3; and from U.S. Department of Agriculture, Major World Crop Areas and Climatic Profiles (Washington, D.C.: U.S. Department of Agriculture, 1987), Agriculture Handbook no. 664.
tures who must consume the products of photosynthesis in order to live. We do this either directly by consuming the products of plants or indirectly by consuming animals. Our consumption must include calories, proteins, fats, vitamins, and minerals. In these ecological terms, the Neolithic revolution was simply the process by which people learned to raise and eat plants and animals under controlled conditions rather than relying on what could be found growing wild. 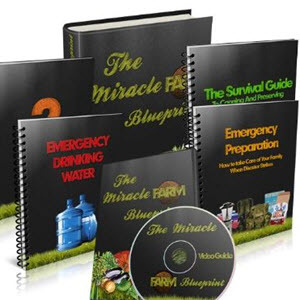 Once the technology of agriculture had been learned, people over a period of several thousand years gradually became completely dependent upon the domesticated products of agriculture rather than the less controlled produce of the land. Evidence for the factors behind the Neolithic revolution remains clouded and ambiguous. What seems certain, however, is that the increased food supplies that eventually came with agriculture permitted the human population to rise far higher than it would have had people remained in hunter-gatherer cultures. Thus, whatever the reasons for turning to farming in the first place, the human species now has no choice whatever about the matter: we are desperate, and we must farm or many of us will die, rather quickly.35 To be sure, small groups and individuals may continue to forage as hunter-gatherers, but that mode of life is not an option for the vast majority of humanity. It is possible to argue at some length about just when the necessity to farm or die really originated, but in all likelihood it was several thousand years ago. It is the longstanding desperation implicit in our need for agriculture that powerfully weds the politics of human societies to the ecological processes of agriculture: security and survival of a group or culture came to be critically dependent upon the control of land and of the plant and animal crops that could be raised on that land. Improvement of agricultural yields very early became an event that conferred power and prestige in political terms upon farming cultures. More recently, plant breeding was a systematic effort to improve yields and therefore produce knowledge of both ecological and political importance. The fact that plant breeding is inherently both political and ecological leads to a series of other questions that focus on wheat specifically. How did wheat as one of the first domesticated species fit into the political ecological framework of Neolithic people? How has that political ecological context of wheat changed over the past 10,000 years? What are the links between the modem science of plant breeding and earlier efforts to increase yields of wheat? And finally, what other political ecological factors before the eighteenth century strongly helped shape wheat breeding? Fragmentary archaeological and historical evidence allows only the sketchiest of answers to be given to these questions. Domestication of wheat was complex not only because wheat was variable (diploid, tetraploid, and hexaploid varieties) but because it was not the only species that came into intimate codependency with people. Barley was domesticated simultaneously with the wheats, while rye, various pulses, and forage crops came later but still in prehistoric times. Animals were also domesticated at about the same time and place as wheat and barley, so sheep, goats, asses, camels, and horses became part of a codependency complex with people. It is possible to ask the question, Why wheat? A variation on the same subject would be Why the changing fortunes of the different types of wheat? Some paleobotanists have argued that the hexaploid Triticum aestivum originated only after the tetraploid emmer moved from its origins in southwestern Asia with a Mediterranean climate to the area of what is now north Iran and southern Russia. There emmer bred with wild Aegilops squarrosa to produce hexaploid wheat. This new type of wheat may have been more ecologically flexible because it grew well in the Mediterranean climate of emmer (mild winters, warm and dry summers) and in the more continental climate of Aegilops squarrosa (cold winters, hot and humid summers).36 Thus the hexaploid's ecological strength and its good bread-making qualities were perhaps the key to Triticum aestivum s dominance in contemporary wheat growing. Whatever the reasons people chose to grow particular varieties of wheat, it seems reasonable to assume that they would not have invested time and effort in farming these grains unless they found it worthwhile. In ecological terms this meant that people obtained more calories of energy from the harvest than they had to invest in the growing of wheat and barley. In addition, perhaps they sought wheat's high-gluten protein and its reliable yields. They may also have liked the taste and texture of wheat as a food. Regardless of why they grew wheat, the plant itself tolerated well enough the regime of temperature, water, and pest organisms that affected its growth. Not only did people have to choose among wheat varieties; evidence from the historical period also indicates that the relative importance of the various wheats and barley have changed in the millennia since their domestication. Barley and the various wheats may have been more equal in their importance as human foods in prehistoric and early historic times. Barley withstands drier conditions, poorer soils, and some salinity.37 Indications from late medieval and early modern Europe are that barley may have tended to yield more kilograms per hectare than wheat.38 If anything, barley was probably the preferred grain at first. In modern times, however, wheat clearly became the premium food, and barley became used primarily for beer making and animal feed. Within the wheats themselves, the first farmers probably emphasized emmer, the first domesticated tetraploid wheat, in preference to the diploid einkorn and the hexaploid wheats. In modern times einkorn has essentially disappeared from commercial production; emmer is a mere remnant; the newer tetraploid, Triticum durum, has attained a small but secure commercial niche for pasta; and the hexaploid bread wheat is commercially supreme over all parts of the wheat-growing world. Why did such changing fortunes affect the wheats and barley so strongly? Was it a matter of ease or reliability of production of the different grains in the field? Was early barley better adapted to southwestern Asia than the early wheats? Or did people find one sort of grain more satisfying than others? If the first uses of the grains were as porridge or gruel, did the emmer wheats make a better meal than einkorn? Perhaps the hexaploid wheats were not particularly useful until people learned how to make leavened bread. Not all wheats make good bread, and barley, because it lacks gluten, is not good for bread making at all. • Sedentary rather than migratory life became the norm of the human condition. At first, most people were sedentary in rural areas and the occupation for most was farming. After the nineteenth century, the norm increasingly came to be sedentary in urban areas with a steadily decreasing number of people engaged directly in farming. Regardless of residence or occupation, however, the human population as a whole was almost completely dependent upon the produce of farming. • With sedentary culture came a richer material life: at first ceramics, then metals, and in more recent years a bewildering array of new materials in an endless parade of tools, jewelry, and amusing trinkets, all of which probably would not have even been invented, or at least not widely used, without a sedentary lifestyle. • Sedentary cultures also were the ones that made the switch from oral to literacy traditions. And with writing came different forms of learning, religion, and ultimately that peculiar form of scholarship we call science. • Also with writing came the ability to organize larger and more hierarchical human societies with intense consequences for the distribution of political power within groups. In fact, the ability of one group of people to control another inevitably came to include authority over land and its use for agricultural purposes. • Increased food supplies from agriculture made it possible to support more people per unit of land than was possible with most hunting and gathering cultures. Quite possibly, population pressure provided the impetus to begin agriculture, and agriculture itself became the vehicle through which more people could survive, thus increasing the necessity of continuing agriculture, with ever higher yields. Not only did the number of people increase, but the number of their domesticated animals also increased because of the new supplies of feed from agriculture. • Increases in the number of people and their livestock in turn created incentives for expansion of agriculture into new lands not previously farmed. As agroecosystems grew in extent, other collections of species disappeared. The woodlands and meadows of southwestern Asia were replaced by fields of wheats and barley. In Southeast Asia, fields of rice grew in the place of wetlands and tropical rain forests. Meso-americans grew maize in the place of highland forests and meadows. Thus not only was the ecology of Homo changed; Homo also changed the ecology of the globe. Wheat breeders in the modern sense, as we shall soon see, did not appear on the scene until many thousands of years after the first crops of wheat and barley were harvested in southwestern Asia. Nevertheless, the intricate connections of wheat agriculture with the ecology and politics of human life were a major part of the context in which wheat breeding was conducted. Because of these connections, wheat-breeding science would inevitably have both ecological and political consequences.